Out of stock since Wednesday, 30 January 2019. Due back soon. 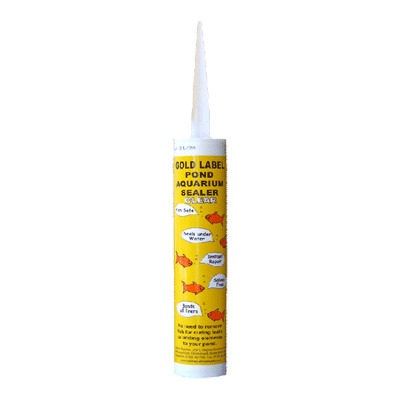 Gold Label Pond & Aquarium Sealer is an under water pond and aquarium sealer which will seal underwater without the need to drain ponds. The sealer is solvent free and will bond to any material, even underwater. It is solvent and isocyanate free and provides an instant repair to all surfaces. Bonds all materials, including Butyl Rubber, Vinyl, Glass, Ceramic, Stone, Concrete, Wood etc. For Ponds, Spas, Pools, Marine, Construction. Can I actually use this in wet conditions ie rain or under water? Yes. Gold Label is able to stick to a surface by displacing moisture from the surface. Will it cure under water? Yes, as it uses the oxygen in the water to cure. In its uncured state, it does. It will not cure below freezing and it will be very slow curing under 5°C. Optimum temperature is 16°C. Can I use it to repair gutters, roofs etc? Yes, Gold Label will stick to most surfaces. Will it stick to vinyl? Yes, make sure surface is clean and sound, and abrade lightly. Can I use Gold Label in marine tanks? Yes, there is no difference in performance between fresh water and salt water. Can I use Gold Label to stick living rock or coral? Yes, because Gold Label is an inert, non-toxic product it can be used safely on coral or living rock. I need to use acrylic glass for safety in my pond / tank. Will Gold Label stick the acrylic to the frame? Gold Label has 4 times the bond strength of silicone on acrylic and has been used in major installations using acrylic sheet. Can I use Gold Label to fix equipment eg pumps, filters to the side of ponds or tanks? support for 24 hours to allow the sealer to cure before any weight is put on it. Can I join two pieces of liner together? tearing and it will allow for any imperfections in joining of the two liners. Do I have to drain the pond/tank before using Gold Label? No, you can use this under water to bond practically anything. Can Gold Label be used to stick rockery/decking/slabs/slate etc to the surround of the pond or the liner? a primer first – contact us for advice. Can I use Gold Label in swimming pools / spas? Yes, this will adhere even in chlorinated water. Can I fix a crack in a concrete pond / pool? Yes. First vee-out the crack to approx 10-20 mm and fill with Gold Label. If concrete is powdery, use primer first. 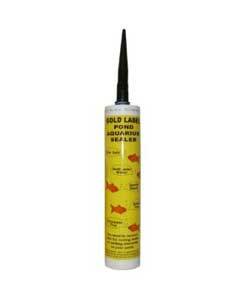 There are currently no questions for Gold Label Pond & Aquarium Sealer - be the first to ask one!